Is it finally time for the DVI port to rest its weary eyes? Zotac think not. If it wasn’t for a single DVI port, their recently launched GTX 1080 Ti ArcticStorm Mini would be a single-slot miniature powerhouse. Here are the best gaming monitors around, and they aren’t DVI-dependent. I have fond memories of DVI, it has been a faithful companion, waiting for the day when, for some godforsaken reason, you need to utilise your rig with a monitor that’s just a little past its prime. But DisplayPort is no spring chicken either – it can do everything DVI can do and more, takes up less room, and is prevalent on Nvidia’s top GPU tech. I have my grumbles with DisplayPort, especially with finding well-made cables, but it’s undeniably the top choice for display connectivity for the foreseeable future. The Zotac ArcticStorm Mini is the world’s smallest liquid-cooled 1080 Ti, and it’s quite stunning in the looks department. It features copper coldplates, precision micro-channels, and standardised tubing fittings to slot right into your current liquid-cooling loop. Offering maximum performance at a fraction of the usual size – this card is anNvidia GTX 1080 Ti after all – it’s the greatest gaming pixel-pusher money can buy, yet Zotac’s card features one crippling downside. At the expense of a single-slot GTX 1080 Ti design, we receive a single DVI-D slot, capable of pushing 1080p 144Hz. How many users will be opting for gaming at 1080p with this enthusiast card, even at the 144Hz that DVI can offer, and even then, on a monitor that only features DVI ports, and cannot utilise an adapter? Forget the three DisplayPort, 4K 144Hz capable, outputs, who needs ‘em? 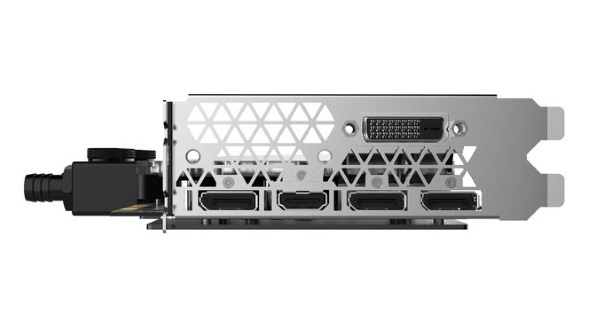 If you desperately need DVI on your hydrated GTX 1080 Ti, then Zotac offer the full-sized ArcticStorm model which features the output, alongside fittings that protrude upwards from the card, occupying the double-slot design. With the Mini, Zotac even went as far to redesign these same liquid cooling fittings to be near-flush to the height of the card, the perfect setup for a single slot design. Yet, infuriatingly, they never went as far to remove the DVI output. 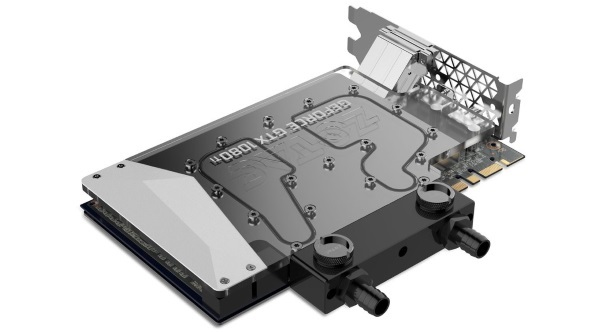 If you need a single-slot card, you can either take a hacksaw to your brand-new Zotac beast, or, if you aren’t afraid of pulling a reference design card (that lacks the DVI output), instead fit it with a single-slot waterblock, with at least EKWB offering a suitable replacement. If you don’t want to get rid of your DVI-dependent equipment, there is an abundance of GTX 1080 Ti graphics cards with the port, and hey, more power to you. But maybe the top-tier, enthusiast, GTX, custom-liquid cooled, miniature, GTX 1080 Ti card, can forego the ageing and rather bulky output, at least just this one time.